A couple of weeks ago we got nameplates for our office doors. I was excited because then people would stop calling me Penny. So I hung it up in its appropriate place, and voila, all of a sudden I'm a theme park adventure. "Experience" is the name of my office, I guess. Our conference rooms are all titled motivational words like "Guide" "Imagination" and "Inspiration". 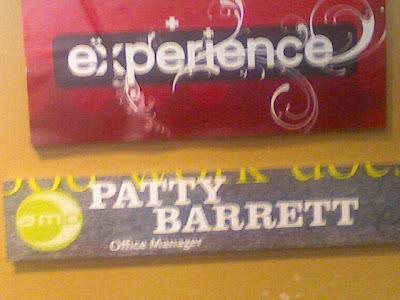 "Experience" is along the same lines... but I now enjoy that my office is the Patty Barrett experience. Which is fitting, since I'm at the very front desk - I'm the one thing you just can't miss! You can't come to this office and miss me! Just like I can't go to Six Flags and miss the Superman Ride... I've got to lose my cell phone somewhere, right? I've got to say, getting up at 7am has been a lot easier. Having a routine is a easier, albeit monotonous. Full-time Patty is kicking through each day with sassy outfits and heels. Overrall, I'm a great experience. 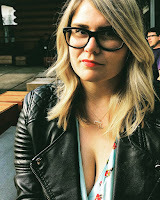 Author's note: No one ever called me Penny. But someone did call me "Pat". I'm not 80.